Dior Hydra Life Pro-Youth Sorbet Eye Creme: Does it Work? Aging can be a tough reality check to accept but, at the end of the day, you will just have to deal with the changes and live with it. It’s not to say that you should simply take forgranted the lines and other visible signs of skin aging that have crept up on your face. The Dior Hydra Life Pro-Youth Sorbet Eye Creme immediately improves your skin’s appearance, literally just seconds after application. It fuses the superbness of a gel and the soft, comforting familiarity of a cream to instantly relax and soothe skin around your eyes. 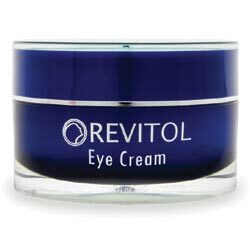 You will notice an immediate radiance and vigor in your eye area, and with prolonged use, this product also helps brighten dark under eye circles and reduces eye puffiness. Suitable for use on all skin types, the Dior Hydra Life Pro-Youth Sorbet Eye Creme carries a hefty price tag of $50 for just a 15 ml jar. After all, this product comes from the House of Dior, undoubtedly one of the most luxurious global brands backed by the multi-billion dollar empire, Moët Hennessy Louis Vuitton SE (LVMH). 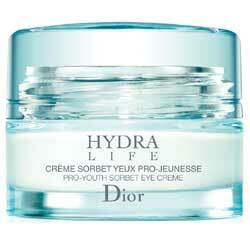 Dior Hydra Life Pro-Youth Sorbet Eye Creme is formulated with a complex combination of synthetic and natural ingredients. The primary ingredients of which are three carefully selected and studied flower extracts that work together to improve and brighten your eye area. 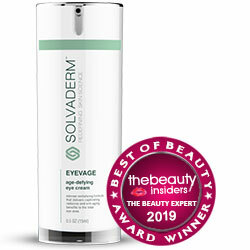 Give your eye area a deep, gentle and brief massage. Dot the product around your eyes then spread in an upwards direction all the way to your eyebrows. Give the skin around the eyes a gentle tapping done in rotating motion to stimulate microcirculation. Use twice daily for optimal results. This product offers novel ingredients. However, there are no studies explaining product claims. Also, it’s cost way above the average eye cream. Dior has been around for a while, and if you’re happy with their products, you can choose to stay loyal to the brand. But, if you don’t have $50 to spend on this product, you’ll certainly find an alternative.